How Can I Raise A Child With Autism? – Hi Blog! I'm Dad. It feels much longer than just the few years that have passed since my son was a baby. I’ve watched him grow from an infant to a toddler to the feisty eight-year-old he is today. His personality is infectious and I’m so grateful that he is in my life. People hear that and it’s greeted with a grin. After all, having a non-verbal child with Autism seems like a daunting responsibility. I’ve heard others commend me for my positive attitude. They see how I am with my son and they know how difficult parenting, no matter the child, can be. The assumption that many people make is that I was somehow prepared for these perceived challenges before they even happened. I was one of those chosen few who was born to raise a kid like Lucas. When he arrived and his diagnosis followed, I had it all together mentally. It all worked out right from the start because I was the exact special person that this special person needed to have a special life. Ah. So special. All of us. I wish I could sell that story to you. How good would that make me look? Something like, “I stared into that boy’s eyes and never had a doubt that we all would be just fine.” I could add little heart emojis on a blue background and post it to Facebook. Everyone would be so inspired by my natural ability and sunny disposition. I can’t do that, though. It’s not true. I went into fatherhood just like everyone else does – brand new and scared of everything. To put it in ridiculously simplistic terms, before the birth of my children, I never had any children. To say that I was ready for a child with Autism is a lie because, truth be told, I wasn’t sure I was ready for any child at all. Yet, here I was, finally getting adjusted to being a father for the second time, only to be clotheslined by an Autism diagnosis followed by a long stretch of uncertainty. He was two and a half when I sat through the orientation for his special needs preschool. I was in a steady haze but could remember staring at the slideshows they showed us from school events. There were parents, teachers, and children all having the time of their lives. Smiles were plentiful. Everyone seemed so happy. I, however, wasn’t. I was terrified, felt like a fraud, and worried I had doomed my boy to a life that I could never be a part of. All I could think was, “I can’t be that dad in the picture.” Those guys in the slideshow weren’t me. They were strangely okay with this outcome that I had been conditioned to fear since my child was still an embryo. They not only were okay, but they were excelling and watching their children succeed. How could these parents be so content? How could they be so positive? They must possess something that I don’t. I could never be like them. Yet, a few years later, here I am. I’m not like them. I am them. The problem I was having at the time was that I was still seeing my son as a stranger who potentially had Autism. He was tiny and our bond, although strong, was one you have with a baby. I wasn’t seeing him as my son and the person he would become. The person he became, I should add, was with me by his side. I didn’t consider that either. We would take every step forward and every slip back together. I’d be there for all of it. As he learned who he was, I would learn right with him. We’d watch each other grow and marvel at how far we’ve come. That’s why these parents were okay in the slides. They had experienced that. Soon, I would too. That’s what happened. I grew. My mindset changed and my approach to life was altered. I let go of the need to dictate my personal perfection. I stopped stressing about worse-case-scenarios or what-ifs. I finally evolved into someone who can just “go with it.” Whatever happens happens. As long as we all have love, patience, and understanding, we’ll be just fine. That’s who I needed to be for my son. That’s who I needed to be for me. So that’s who I became. The transition I feared could never happen did happen, and it was seamless. So why is it so important to me that I don’t sugarcoat those early days? I mean, they make me feel awful to remember. Memories like that zombie-like walk through his school orientation or the day that I first blurted out my suspicions about his Autism while sitting at the California Pizza Kitchen give me that rotten feeling in the pit of my stomach. I wish I could pretend none of that happened and just smile about the woken Autism Warrior, or whatever you might want to call it, that I became today. That would be great for me. It wouldn’t be great for those in the same position I was in six years ago, though. I know what it’s like to feel guilt about your shame and shame about your guilt. I remember feeling thrust into a role in life that I had never imagined taking on. I experienced what it was like to watch other parents, like the me of today, grinning on slideshows like they possessed some magic ability I didn’t. The truth is, no one has that ability from day one. How Autism affects a family depends on so many factors. Even those with vast knowledge of Autism can’t be prepared for how it will impact their own lives when someone they love is diagnosed. It’s all new for every family, every time. Worrying about your children isn’t something to be ashamed of. It’s something you’re suppose to do because you love them. Just like new parents can’t fathom how they can raise babies, new parents to children diagnosed with Autism feel the same way. I know I did. Eventually, though, you find your groove and soon, things you thought were impossible become parts of your daily routine. You turn into the person you never thought you could be and find that dread of the unknown you had at first is something that’s erased over time. There’s no secrets. No magic abilities. The question is simple. How can I raise a child with Autism? I just do. And it’s great. 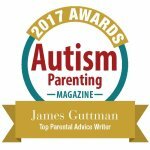 Autism is not a bad word and has not robbed me of a relationship with my son. In fact, it has helped shape his unique and wonderful personality. I didn’t see it then, but I do today. I may have worried about whether I could raise him at first. I consider myself lucky that I was given the chance to find out I could.